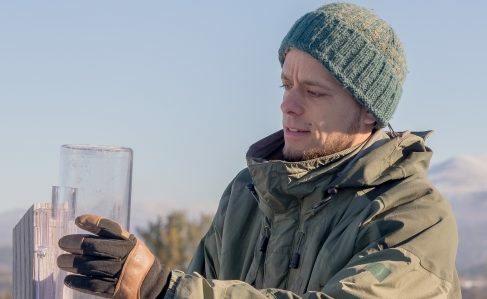 CoCoRaHS (Community Collaborative Rain, Hail, and Snow Network), is one of the largest citizen science collaboratives in the world. Each day, thousands of dedicated volunteers take precipitation observations. These observations are freely available for research and educational applications. They help to verify and improve weather forecasts. In addition, they give a better understanding of a region’s climate. Despite technological advances in weather models and instruments, nothing can compare with the accuracy of “ground truth” observations. A recent report published in the Bulletin of the American Meteorological Society stated that as of mid-2015, CoCoRaHS volunteers had submitted over 31 million daily precipitation reports and tens of thousands of reports of hail, heavy rain, and snow, representing over 1.5 million volunteer hours. NVU-Lyndon professor Dr. Jay Shafer currently serves as the CoCoRaHS Vermont Coordinator. He oversees a team of over 100 volunteer public observers. On Vermont Vermont Public Radio’s Vermont Edition program, Dr. Shafer said, “We’re really after how much water is falling from the sky and trying to measure that. And that’s really important for us to understand the weather and climate across Vermont.” The terrain that makes up Vermont’s unique landscape has significant effects on the variability of the weather. Substantial inconsistency in rainfall and snowfall are often observed from one town to the next. This is why having a dense network of CoCoRaHS observers is useful. How do I join CoCoRaHS? CoCoRaHS needs more volunteers. We are always interested in recruiting new, dedicated observers from all over the state! Simply click on the “Join CoCoRaHS” link at www.cocorahs.org!